Green smoothies are everywhere and I have my personal favorites, and not-favorites-but-drink-it-anyway. 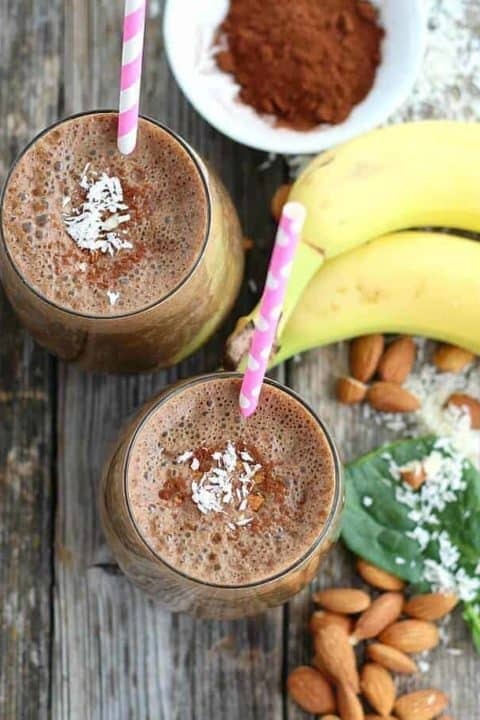 This chocolate beauty is a wonderful switch-over for a healthy treat or dessert and the combination of chocolate, almonds and coconut makes this obviously named the Almond Joy Smoothie. I found a version of this recipe over on Blendtec’s recipe site. Though similar, their version had more sugar grams than I wanted and the flavor was also more subtle on the coconut than I expected. 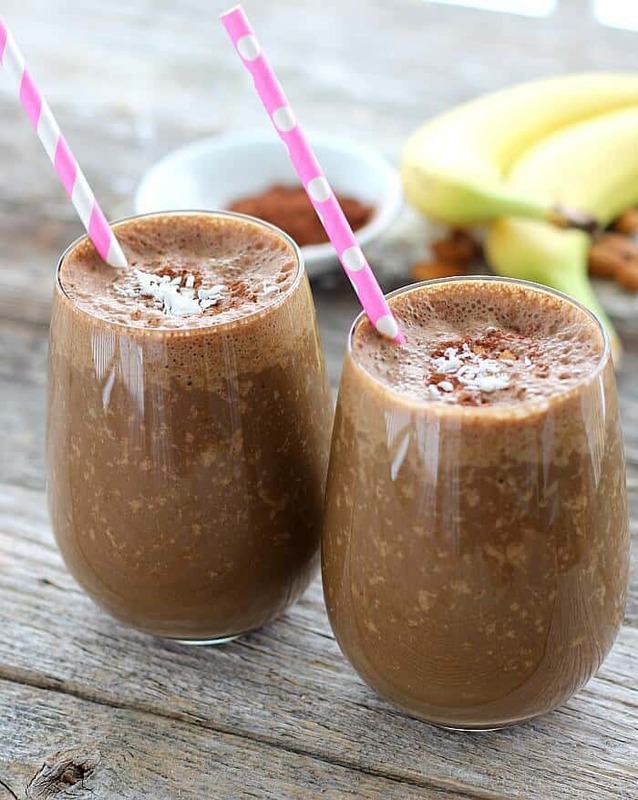 Since this is a healthy “dessert” or treat smoothie, the serving size is only about eight ounces, but this is rich in a good way, so a one cup serving is plenty. As you can see, spinach is one of the key ingredients but unless you’re the person making the smoothie, you’d never know it was in there. That fact makes this a great one to feed the kids or anyone who has a problem with the whole ‘green drink thing’. Almond Joy Smoothie finishes up nice and thick like a shake, smooth yet airy as you can see, thanks to the ice in the drink. The almonds add such a nutty richness, and the banana thickens everything just so. I thought I’d take it a step further and freeze the Almond Joy Smoothie… don’t try that. There isn’t enough fat to keep it from becoming solid and the flavors kind of mute after being in the freezer. So this is a treat best enjoyed right after you make it. Since it only takes a few minutes to create, you can satisfy your chocolate craving in a snap. As for the health benefits, almonds are great sources of healthy fats, fiber, protein and Vitamin E. Spinach is a great source of minerals as well as fiber and protein, yet again. 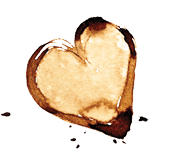 Cocoa powder (even better if you use cacao) is touted for many “possible” cardiovascular benefits and other minerals. The banana is high in fiber as well as potassium. But with all that, don’t forget this is a really quick tasty treat. We don’t sweeten ours at all (it didn’t need it! ), but you can make it as decadently sweet as you like with added honey or whatever sweetener you choose. Tasty with almond or coconut milk, but if you wish, use dairy milk. This is a great springboard kind of recipe. Make it as I have here for super healthy, vegan and Paleo-friendly, or change it up with ice cream, honey or sugar. 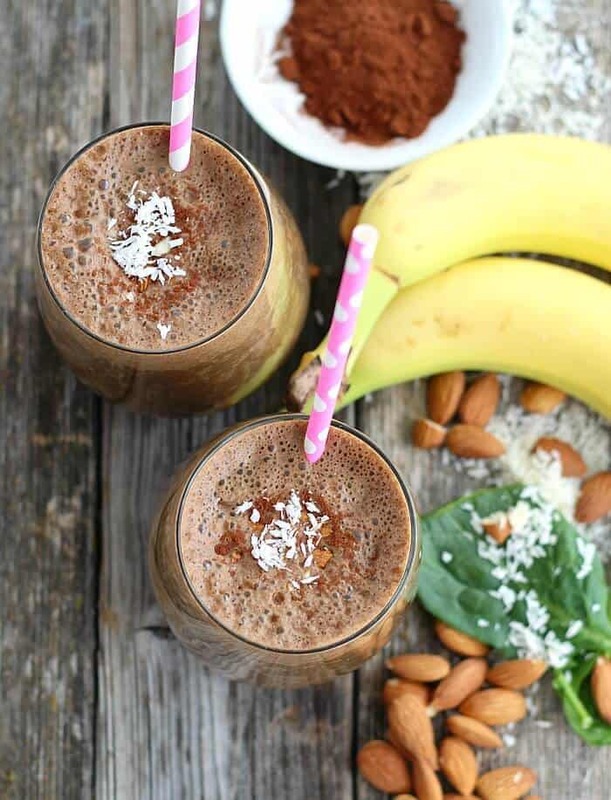 Any way you want it, the combination of chocolate, coconut and almonds will not disappoint. The quantities here are to be used as a guide for the Almond Joy Smoothie. Add more or less or whatever you want, however, don't skip the spinach! I promise you won't even know it's here. For Blendtec owners, select "Smoothie" cycle. This looks so tasty. Can’t wait to try it. Thanks, Sally. This is INCREDIBLE!! Mind blown. Thank you so much!!! Erin, I’m so glad you liked it. 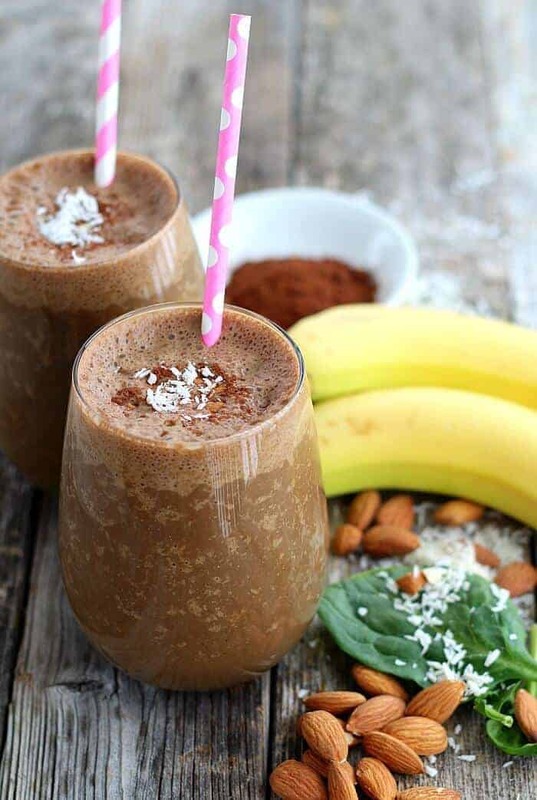 You have me craving this smoothie again right now! I appreciate you taking the time to comment. This looks soooooo good. I can’t wait to try it…. Thanks Sally. My grandpa used to eat Almond Joys, and it’s one of my favorite memories from childhood. (I know it’s strange…but it’s what I remember!) 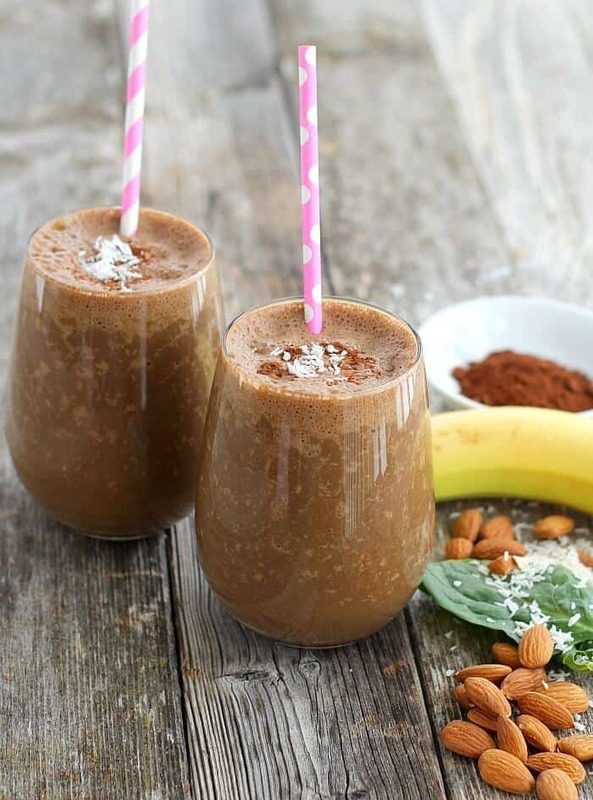 I’m thinking I would love this smoothie with the chocolate and almond flavors in there. Yum! I love that memory of your grandpa, David (my grandpa, one of my favorite people in the world, always had Juicy Fruit gum in his pocket and to this day, I’m reminded of him if I smell it). Thanks for stopping by and if you try the Almond Joy Smoothie, cheers to your grandfather from me.